As you know, the Cumberland County School system is moving full steam ahead with its community-driven strategic planning process. It’s time to narrow down the three to five focus areas for the new strategic plan, and we want to hear from you! 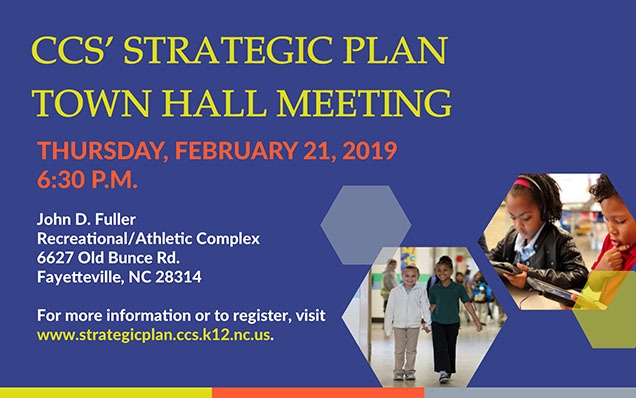 We are hosting a Strategic Plan Town Hall Meeting at John D. Fuller Recreational/Athletic Complex at 6:30 p.m. on Thursday, February 21. Please join us and let your voice be heard. Let’s work together to develop a strategic plan that will truly help our students succeed in school and in life.